Pure comfort food, tartiflette is made with potatoes, bacon and lots and lots of melty cheese. Make it and serve it to someone who could use some love today. Ah, Paris. The City of Light, the City of Love. Every city we move to is unexpected and an adventure. Fast into the fray I plunge, learning new words, new places, getting lost with regularity and discovering the hidden corners by chance. Paris was no different. My high school French opened the doors just a crack. I could read signs and ask simple questions. Conversations about anything less than the mundane were impossible. Ou est le toilette, s’il vous plaît? Est-ce que il-y-a des oignons? I negotiated markets and buses and the Metro, all pushing a bundled-up toddler in an umbrella stroller, upstairs and down, trying hard to move at the same breakneck speed as the rest and not hold up the busy, busy people all dressed in grey and black. In time my French became more fluent, as I practiced daily with neighbors, shopkeepers, the pediatrician, the pharmacist. Our second baby was born there in a local maternity hospital, chosen for its proximity to home and baby-centric focus, rather than the big, swanky American Hospital of Paris where the nurses might speak English. However decent my French, they still called me la américaine but it was a title I was pleased to wear because it was always accompanied by an approving nod of the head. I wasn’t their typical patient and they seemed to appreciate that I wanted to do everything for my baby, including keeping her with me all night. I made friends with long time expat residents as well as a few local ladies who had lived abroad. We met for tea, for lunch, to watch our children on swings and slides in a nearby park. We compared notes on child rearing, schools and swapped recipes. As a family, we traveled around France, ogling the stained glass in churches and and the masterpieces in museums, often sitting with a picnic lunch of cheese and baguettes in the beautifully maintained grounds, feeling quite at one with the families playing and eating around us, just enjoying the view and the sunshine. And the wine. We planted tomatoes in early summer, feasted on the cherries from our large backyard tree when the weather turned warm and pruned the climbing roses when the bright yellow Forsythia bloomed in the front yard. My neighbor would call out to me in greeting, “Coo, coo!” then we chatted companionably across our party wall and the baker around the corner knew just what I would order, smiling in welcome as I pushed into her warm shop, my two small blondies in tow. 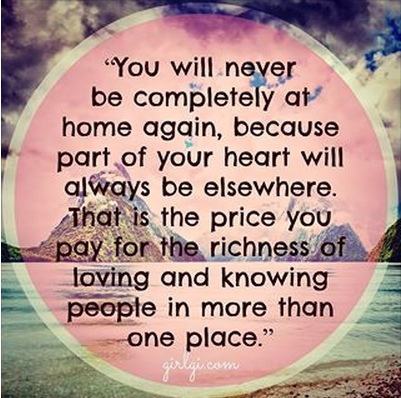 In short, Paris, like many other places we have lived, became home. As I watch the news this morning, horrified at the terrorist attacks on the people of Paris, I was reminded of a meme I shared a few years back with a friend who writes often on the third culture kid experience. I mourn for the Paris that was home and for the friends I still love there, who keep part of my heart. Even as I pray for Paris, I am thanking God that they are safe. Which makes me feel guilty because so many have lost loved ones. Pray for Paris with me! God help us all. 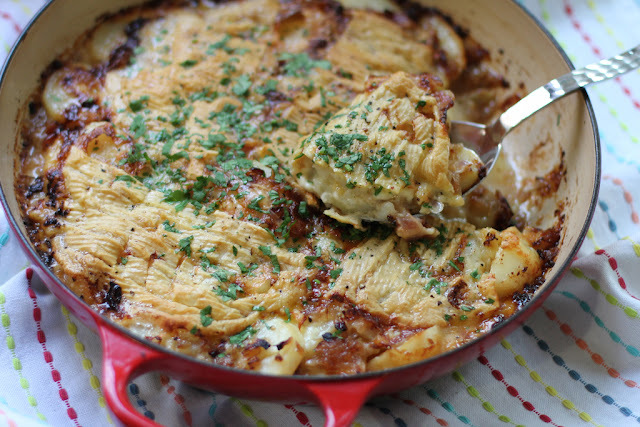 When the cold weather starts closing in and the skies turn grey, French mothers warm and comfort their families with tartiflette, a rich hearty dish made with potatoes and melty Reblochon cheese. It seemed like the perfect dish for dinner tonight, when we could all use some comforting. My tartiflette has been adapted from these two recipes from Journal des Femmes and Marmiton. 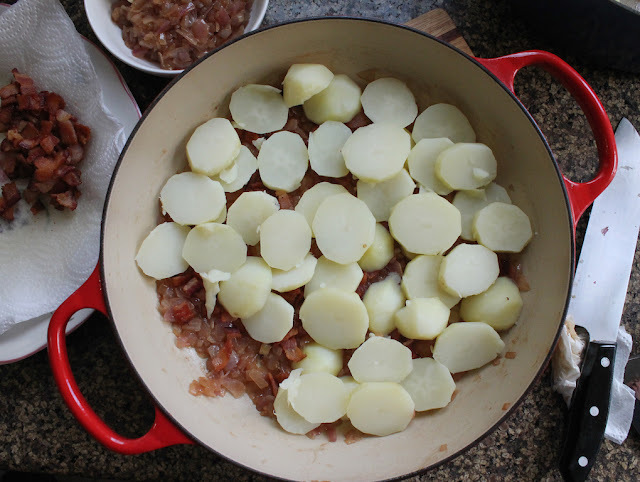 Peel the potatoes and cook them in a large pot of salted water just until a knife slides in easily. Drain and set them aside to cool. 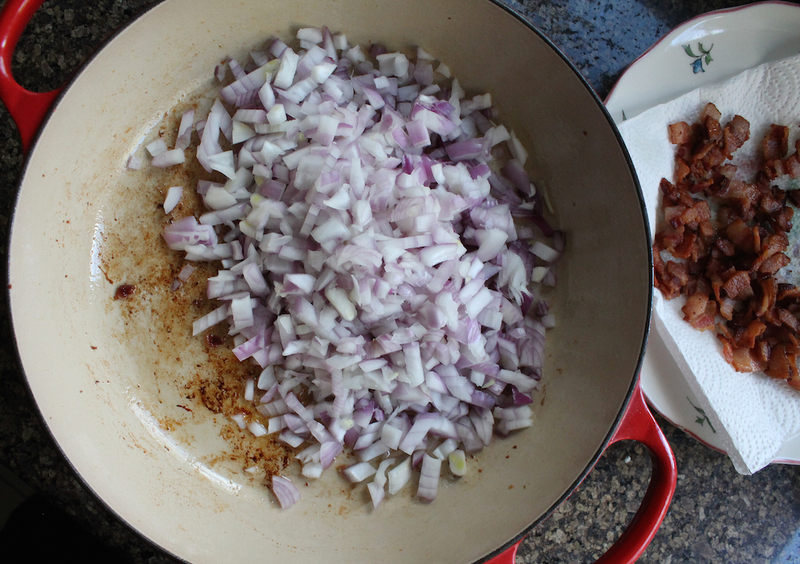 While the potatoes are cooking, cut your bacon into little strips and chop your onions. 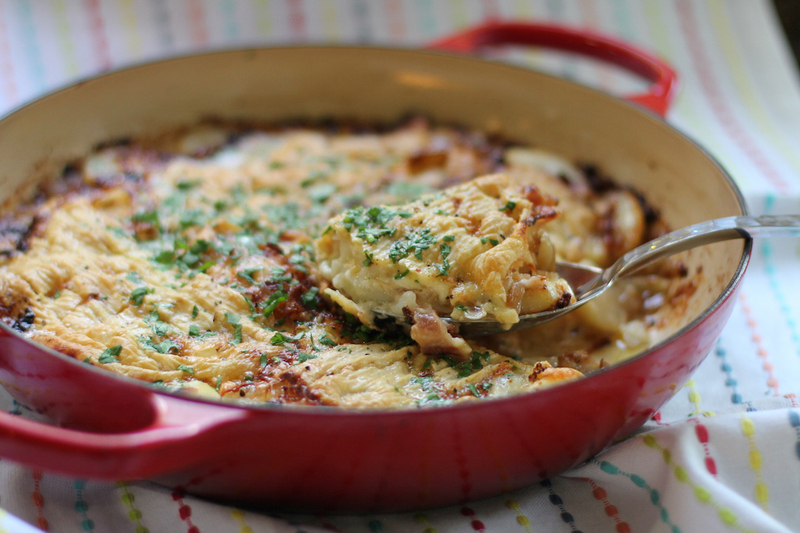 In a large oven-proof pan, fry the bacon until it is crispy. Remove from the pan and drain on paper towels. Remove all but a tablespoon or two of the bacon grease and discard. Add the chopped onions to the bacon pan and sauté until golden. Pour in the white wine and cook until the alcohol has evaporated. 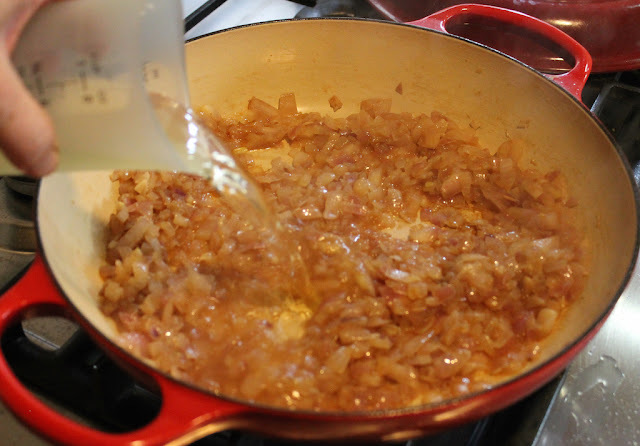 Remove half of the onions and spread the remainder evenly in the pan. Top with half of the fried bacon. Slice the potatoes and lay them out in the pan. Top with the rest of the onions and bacon. 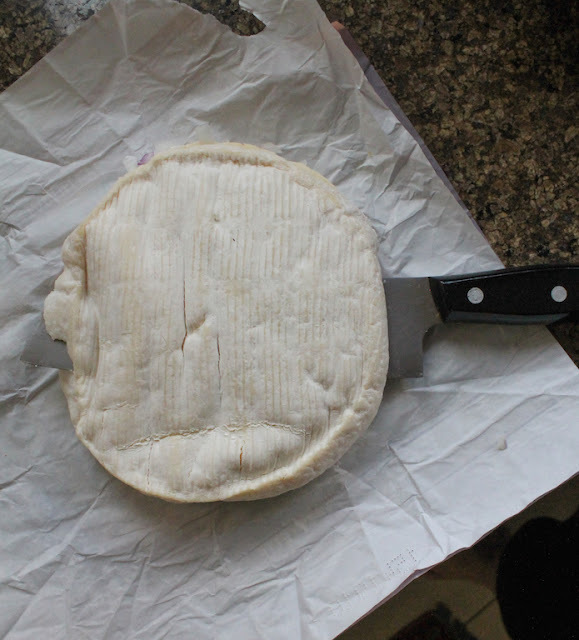 Cut the cheese in half lengthwise. By which I mean right through its equator. Put the pieces in the pan, cut side down. 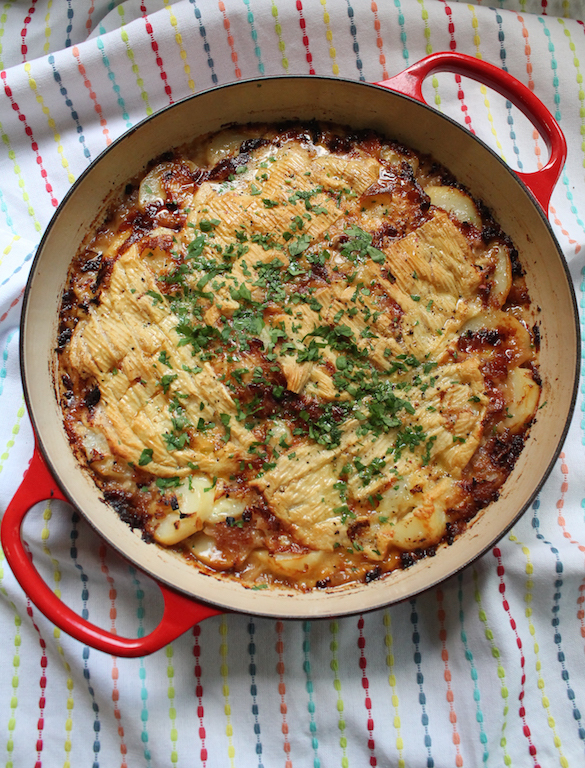 I also cut mine in half again to better distribute melty cheese over all of the potatoes. 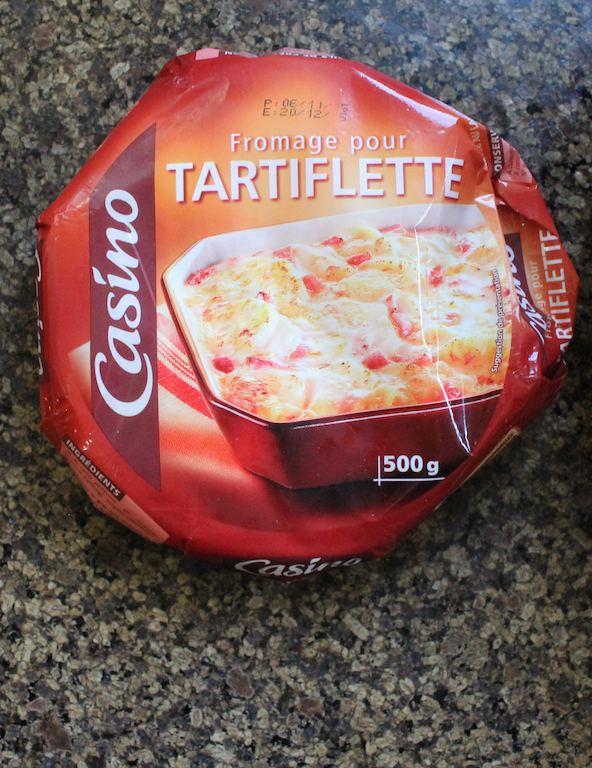 Bake in your preheated oven for about 30 minutes or until the cheese is completely melted. If it's not browned enough for your liking, put it under the broiler or grill for a few minutes or until it is lovely and golden. Sprinkle with some fresh ground black pepper. 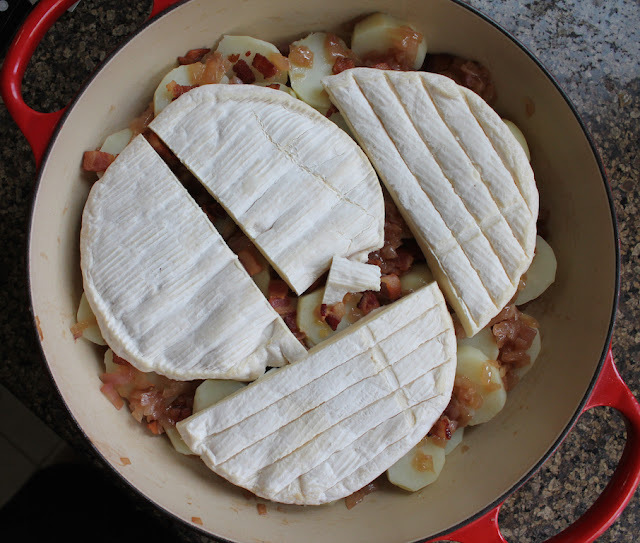 If you are serving the tartiflette from the pan, which I highly recommend, you can also add a sprinkle of minced parsley for decoration. Make this for someone you love and serve it with a fresh green salad dressed in a light vinaigrette. Enjoy!